We all know the benefits of getting a massage as humans. It can be incredibly relaxing and can help lower blood pressure, improve circulation, soothe sore joints, and more. 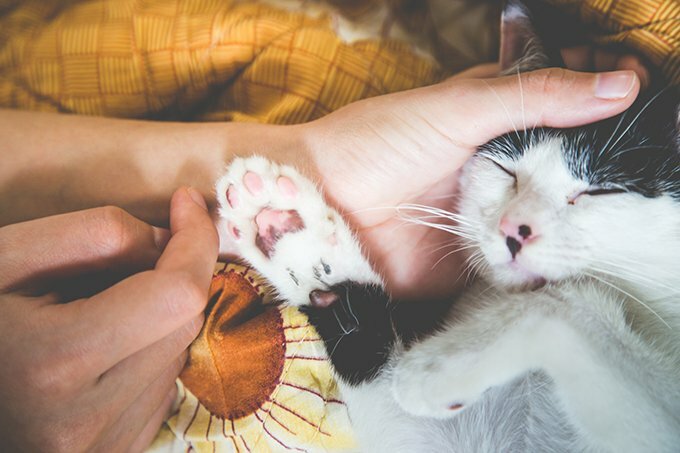 Turns out, these benefits of massage aren’t exclusive to humans; they are amazing for cats, too! Here are the basic steps of giving your cat a massage. No one wants you to take out your day on them via an all too-aggressive massage, including your cat. You may not even realize it, but your own stresses and anxieties can manifest with white-knuckled shoulder rubs for your kitty. 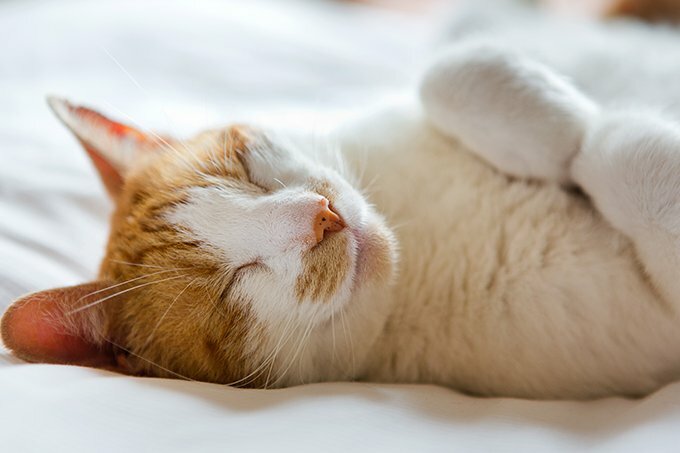 Before you go to give your cat a massage, center yourself with a few calming breaths. Cats are also incredibly perceptive, so if you go to give your cat a “relaxing” massage when you are all keyed up, it will be anything but for your cat. Before starting any type of pet or massage, talk to your cat in a calm, soothing voice. Give yourself permission to go full-on crazy cat person and serenade them, use your gentle babying voice, or any sort of verbal communication that puts your cat at ease. If your cat loves being scratched under the chin, start there to show your cat this is going to be a pleasant experience. Do not pet anywhere on the face or the head, however, if your cat doesn’t normally go for that. Cats can interpret that as a threat and will be anything but relaxed. Slowly introduce your touch to your cat’s favorite spot. Your cat will begin to relax even more and will confirm this with slow blinking, eventual eye closing, and a lot of purring. Take this as a sign to move onto the full body massage. Once your kitty is all blissed out from petting, start the full body massage with slow, lightly pressured strokes down your cat’s back, from their neck to the base of his tail. While it may be tempting to rush through this, use slow, deliberate motion so your cat gets the full physical benefits of the massage. Your can use either your thumbs or your pointer finger and middle finger together to make these strokes down your cat’s back. Do this 6-10 times, depending on what read you are getting on your cat. Once you have given the back a good amount of attention, move onto your cat’s shoulders. Again, using either your thumbs or two fingers together, make slow, very lightly pressured circles around his shoulder blades. Do this at least ten times, and feel free to go a little longer if it seems like your cat has reached nirvana. Most cats enjoy being scratched and rubbed around their ears and chin. If this is your cat, go to town and massage their favorite spots once again. At this point your cat may be so relaxed that his purrs are reverberating through your hand, or he could be drooling slightly. All signs that so far you are giving a great cat massage. At this point, if your cat is not too sensitive around the chest, you can take one hand and gently cup your cat’s chest with it. Use your finger pads to gently massage the chest in tiny, circular motions. You can also pull your fingers together towards the center of his chest with a light pressure and repeat. Some cats don’t mind their paws being touched, others hate it. If your cat seems relaxed enough, take your thumb and rub the center pad of each of their paws for 30 seconds. 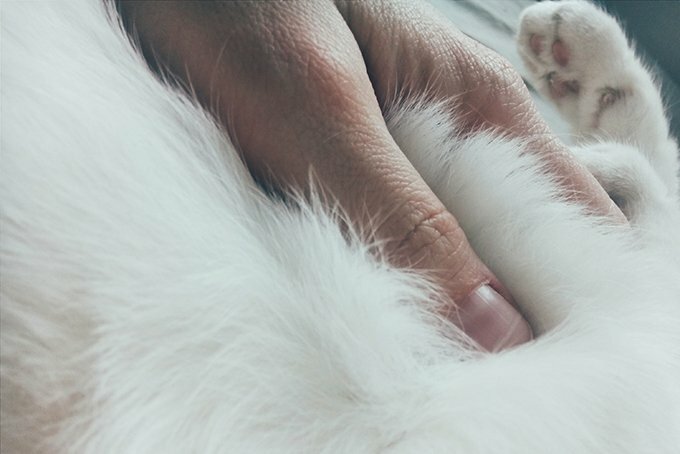 Cat’s paws do a lot of work and deserve attention, just like the rest of their body! The benefits of giving your cat a massage are endless. It is a useful way to do your own health check on your cat. During massage, you can check for ticks, fleas, or other parasites. You can also discover cuts or abrasions your cat may have acquired unbeknownst to you. 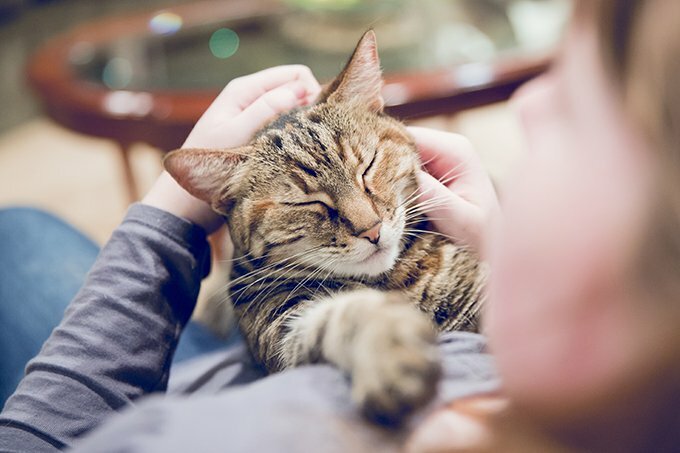 Regular massages for your cat will also help you “know” your cat’s body, so you may able to feel if something is off down the road, like a new foreign lump under the skin or a tenderness in a certain area of your cat’s body. 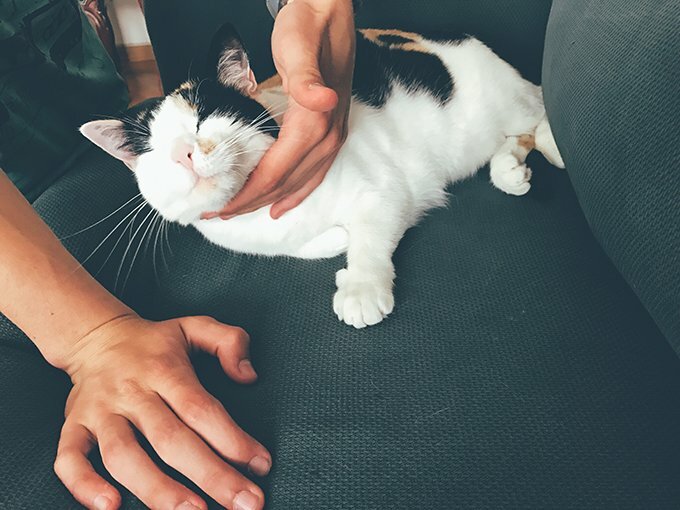 Regular massages can also help strengthen the bond you have with your cat, and may even lead to them becoming more affectionate than ever. Do you give your cat massages? Have any tips? Let us know in the comments.